As chronic illness sufferers, we often feel bored, especially those of us stuck at home. I used to have a high energy job that kept both my brain and body busy. I used to have a house full of children needing supervision, training, and attention. Now that I’m unable to work, and I only have one 17 year old at home, feelings of boredom are frequent. I can’t remember being bored, before I got sidetracked with chronic illness. There was so much to do and experience that boredom was not possible. Are you experiencing more boredom in your life since you got sick? I believe that there are ways to relieve boredom for all of us, even if you’re stuck in bed. While taking an online meditation class with Julie Holliday, she mentioned the importance of doing things in different ways or changing our view. This helps keep our brains happy, because they crave novelty. So I sat in a different chair at the table and looked out a bay window with lush green plants in it, instead of gazing at the wall with peeled wallpaper on it. It was such a pleasant change of view, and made eating alone so much better! What can you change? The pictures on the wall? Rearrange them or take them down for awhile. My mom was great at rearranging the furniture, which my dad did not appreciate. Even just clearing off a table or decluttering can do wonders to lift our spirits. 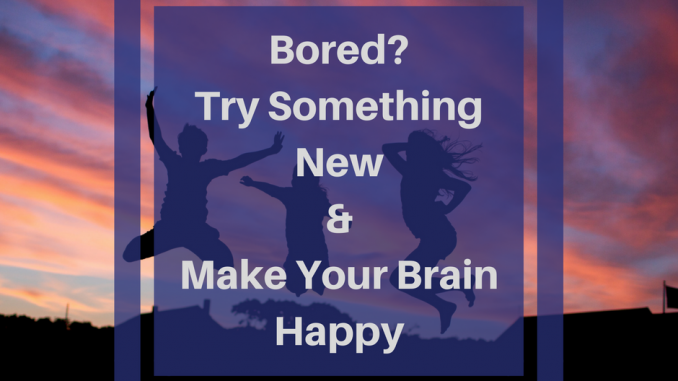 Need more boredom-busting ideas? Try something new. If you can’t get out, there are lots of topics to explore on the internet. If you have children, borrow some of their art supplies and play around. You might discover your hidden creative. Try a musical instrument. I’ve been dabbling with a harmonica since I learned it’s beneficial to people with lung disease. I don’t sound great, but I enjoy it while I’m playing. You could try a new food or recipe. Eat at a new restaurant. Invite someone over for a pot-luck meal. It doesn’t have to be expensive or fancy. The important thing is to do something new. Will our health interfere at times? Yes, but the only thing we have to lose is BOREDOM.